Safety Jet allows operators to change to a “pump jet” in less than 10 minutes. The Safety Jet allows for operation of the Raider Outboards in “brown” water where debris is present; beneficial for training whereby no moving parts of the engine can hurt the trainees if they should come in contact with the lower unit; protects the lower unit when beaching and can withstand minor contract with underwater obstacles. The user can switch back to a propeller within 10 minutes. During training soldiers can be seriously injured or killed by an exposed rotating boat propeller. Under Government funding the USMC recognized the safety of a jet drive and successfully integrated jet drives in their systems. Jet drives have been in existence for many years and comes in many shapes and sizes. The Safety Jet fits the 20 inch transom that Rubber Inflatable Boats use. 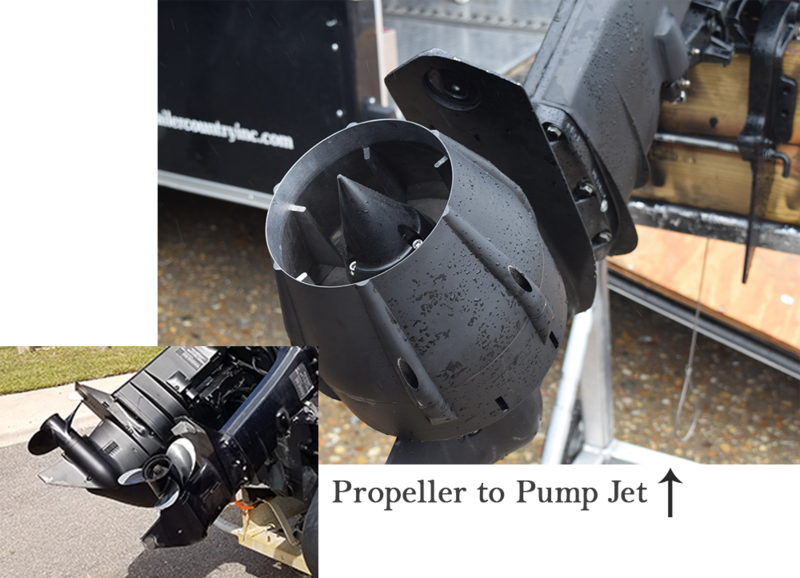 The Raider Outboard can be ordered with either propeller or Safety Jet. The Safety Jet option can be ordered separately as a kit and will take ap­proximately one hour to move from propeller to Safety Jet. The Safety Jet will fit the Commercial Off The Shelf commercial outboard. Kit form includes all lower unit parts and gaskets.